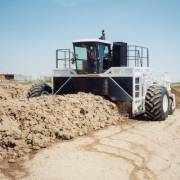 Please see our current selection of used Composting Equipment for sale listed below, including: Pull-Type and Self-Propelled windrow type Compost Turners, Compost Baggers and Other Composting Equipment. If you have any questions regarding a listing, or would like help selecting the right equipment for your operation, please take advantage of our free consultation. For more information on planning your wood and greenwaste recycling operation, selecting the right equipment, equipment maintenance and money saving ideas, please visit our free online Equipment Guide. 1996 Earthsaver CT-16 Tuner. Great shape low hours. Ready to work.